The Internet started almost exactly 30 years ago when ARPANet switched to the TCP/IP protocol suite. At that time, only a few experimental hosts were connected to the network. Three decades later, the Internet is part of our lives and most users access the Internet by using broadband access or cellular networks. Understanding the performance characteristics of these networks is essential to understand the factors that influence Internet protocols. In 2011, Srikanth Sundaresan and several other researchers presented a very interesting paper  at SIGCOMM that analysed a large number of measurement studies conducted by using modified home access routers. Two types of devices were used : dozen of home routers modified by the Bismark project and several thousands of measurement boxes deployed by Samknows throughout the US. 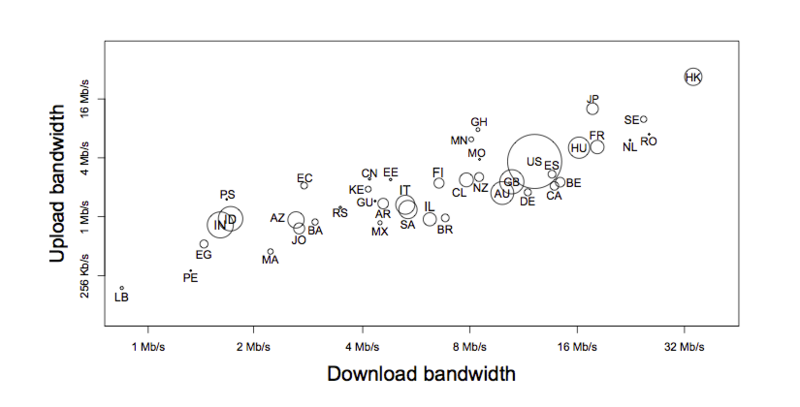 This paper revealed that there is a huge diversity in broadband performance in the US. This diversity depends on the chosen ISP, the chosen plan and also the geographical location. The paper was later revised and published in Communications of the ACM, ACM’s flagship magazine . During the last edition of the Internet Measurements Conference, Joel Somers, Paul Barford and Igor Canadi presented two papers that analyse Internet performance from a different viewpoint. uses data from http://www.speedtest.net and SamKnows to analyse broadband performance. This enables them to provide a much more global analysis of broadband performance. For example, the figure below shows the average download throughput measured in different countries. The second paper,  explores the performance of WiFi and cellular data networks in more than a dozen of cities, including Brussels. Latency and bandwidth information is extracted from http://www.speedtest.net. A first point to be noted from these measurements is that cellular and WiFi performance are significantly lower than broadband performance, despite all the efforts in deploying higher speed wireless networks. Note that the data was collected in February-June 2011, the network performance might have changed since. When comparing WiFi and cellular data, WiFi is consistently faster in all studied regions. In Brussels for example, WiFi download throughput is 8.6 Mbps in Brussels while the average cellular download throughput is only 1.2Mbps. Latency is also an important performance factor. In Brussels, the average WiFi latency is slightly above 100 milliseconds while it reaches 281 milliseconds for cellular networks. Both papers are recommended readings for anyone willing to better understand the performance of Internet access networks. (1, 2) Igor Canadi, Paul Barford, and Joel Sommers. Revisiting Broadband Performance. In the 2012 Internet Measurements conference, 273–286. New York, New York, USA, 2012. ACM Press. Joel Sommers and Paul Barford. Cell vs. WiFi : On the Performance of Metro Area Mobile Connections. In the 2012 Internet Measurements conference, 301. New York, New York, USA, 2012. ACM Press. S Sundaresan, W de Donato, N Feamster, Renata Teixeira, Sam Crawford, and Antonio Pescapè. Broadband internet performance: a view from the gateway. SIGCOMM, 2011. Srikanth Sundaresan, Walter de Donato, Nick Feamster, Renata Teixeira, Sam Crawford, and Antonio Pescapè. Measuring home broadband performance. ACM SIGCOMM Computer Communication Review, 55(11):100, November 2012.